​Owning a Frenchie means constant vigilance! Between palate and tail, a lot can go wrong, and many Frenchie owners joke about sending our vet's kids to uni while ruefully offering up our credit cards at the counter. Understanding that your Frenchie will likely require more medical attention, and in the long run will very likely be more expensive than another breed, may help you decide whether a Frenchie is for you. Ear infections can be caused by allergies to food, to the environment, or because they are not being cleaned often enough. Yeast infections are a common problem and your Vet will recommend which medication to use for this issue. Since Frenchie ears stick straight up, they catch all kinds of gunk. Frenchie ears should be cleaned once a week. You can get a good ear-cleaning solution from your vet, and while you are there, ask for an ear-cleaning demonstration—proper ear cleaning is different than you might think! Ear infections can lead to cauliflower like growths in the ear, which left untreated can result in deafness. Please consult your Vet in regards to this and please never use an ear-bud to clean your dog’s ears. Another cause for your dog to scratch or shake his head is the horrible foxtail. A foxtail is a seed container with a sharp, barbed end that can embed in the flesh of an animal, and has been known to go so far under the skin that it can kill when an infection forms around it. Mites and other parasites can cause your dog’s ears to become infected and/or to smell bad. If your dog’s hair starts to thin or get patchy on the ears or the edge of the skin gets dry and crumbly, a vet visit is in order. Adrenal problems or hormonal changes like hypothyroidism could be the cause. Ear infections can cause dogs to scratch their ears or shake their heads, resulting in what is called a hematoma, which is essentially a bruise that causes the ear flap to swell and fill with blood. This will sometimes require surgery. Sometimes a Frenchie can survive a hematoma with his ears upright, but more often a hematoma will result in a crumply ear. ​Our Frenchies’ eyes are frequently called “bumpers” because they are protuberant on the sides and front and there is not much snout to protect them. A dash into a rose bush, a hostile meeting with a cat—well, you can imagine the many ways a Frenchie could injure an eye! If your dog’s eye is red, if he’s scratching it, if he’s squinting, if it is teary or there are any spots on the surface of the eye—get to the vet without delay. Frenchies get eye ulcers very frequently. Eye ulcers are generally caused by an injury to the eye or even by dry eye. You will not likely be able to see the injury, but your dog’s eye may be watering or your dog might be squinting or rubbing his eye and can be quite painful. Untreated eye ulcers can lead to infection, blindness, and, in the worst cases, your dog can even lose his eye. There are various degrees of ulcers, ranging from relatively mild to very serious, if your dog is squinting or rubbing her eye, don’t wait—get to the vet. This injury will require the hard-plastic cone of shame for at least a few days. 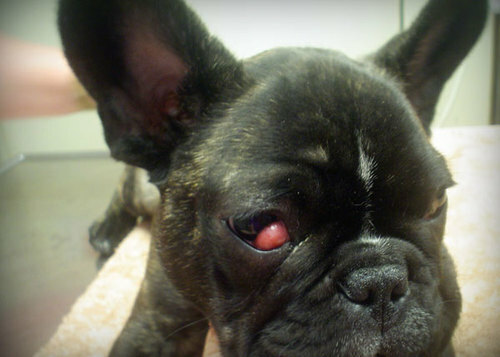 Cherry eye is the condition that looks most dire but is probably be least dangerous of the eye conditions Frenchies are prone to. You’ll notice a cherry red bulge in the corner of your dog’s eye. It’s caused by the prolapse of the third membrane of the eye. Sometimes you can press the bulge and with slight manipulation gently put it back into place, in some cases it may never appear again but more often than not surgical intervention is need, please consult your Vet if you have any concerns. 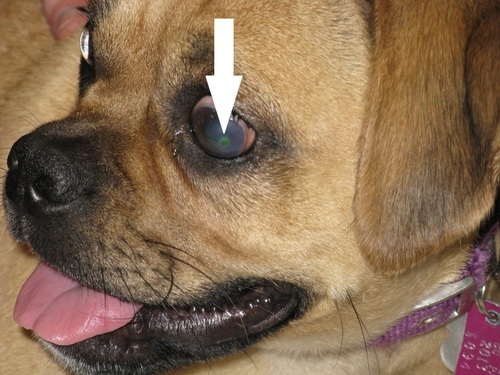 The cause of cherry eye vary from 'someone kicked sand in my face', overheating, hereditary etc. Whatever the reason, please don't leave it and hope it goes away. Another very common problem for Frenchies is dry eye, and as mentioned above, dry eye is one of the causes of corneal ulcers in Frenchies. Dry eye means tears aren’t being produced properly, whether from injury, age, or some other cause. You may know your dog is having trouble in a few different ways, but sometimes there will be a thick or gooey discharge instead of proper tears. Or your dog’s eye might look cloudy or not have the usual bright appearance. The fix for dry eye is easy, but you must be diligent with giving eye drops or applying the ointment your vet will prescribe. Over the counter eye drops or saline are not going to work, unfortunately. Pigmentary keratitis can be hard to see, but it often means that some constant or chronic irritation to the surface of the eye has caused discoloration or scar tissue deposits on the eye. There are many reasons for that constant scarring, including dry eye, including a condition called entropion, where a number of eyelashes form on the inside of the eyelid. There’s a surgery to take care of serious cases, or vets can pluck the lashes every few weeks. There are a number of other constant irritants to the eye, so if you see a brownish spot or patch on the surface of your dog’s eye or spreading over the conjunctiva or white part, mention it to your vet. Foot Licking is an issue that we hear about all the time, there are thousands upon thousands of remedies online for this extremely annoying habit and we have most certainly tried just about all of them. The majority of time it starts when your dog goes outside onto the wet grass...comes inside and then the foot licking begins. Nine times out of ten a yeast infection starts to form and so the licking goes on, then perhaps, they start to scratch their ears in turn the yeast infection is transferred to the ears and then because of all the licking your precious pooch starts to develop a coughing of phlegmy sound. We have a couple of solutions for you to try before you go running off to your Vet and spend hundreds of dollars. Over the counter products for athletes foot/antifungal creams like Mycostatin will kill off the yeast. If it has moved on and developed into the mouth Mycostatin oral drops (children's dose) will help. These two products will help you combat the paws and the mouth. One product we have had huge success with is Mushers Secret (paws) we have tried this on its own without the above products and have been very pleased with the results. If you choose to go down the Mycostatin road then we would recommend putting Mushers Secret on over the top over the Mycostatin . You might have to go to the Vet for Dermotic ear drops, (we find this to be the most successful of the numerous ear treatments) once the yeast infection is cleared up continue to keep your dogs ears clean with Blackmores Paw gentle ear cleaner or alternatively you can make up a solution of 1 part Malaseb to 30 parts water and use a cotton ball to clean out the ears. Another good product for all things itchy is Epsom salts, available at most supermarkets, this has some wonderful properties in helping your dog and you, we could go on and on about it but do your homework and google it, in a nutshell it raises the Ph of water to kill of the yeast and other uglies. Epsom salts can be used as a foot soak or as a final rinse when you bath your dog...if you have the facilities to soak a good percentage of your dog in the salts, a five to eight minute soak is good. Take 2 teabags and steep in 2 cups of hot water, discard the teabags and once cooled place in a spray bottle and spray on itchy/inflamed areas. Please note we are not guaranteeing you a sure-fire cure, all we are saying is that the above has worked on some of our rescues and our own personal dogs. Diet can also play a huge part in your dogs well-being. These are a few of the most common deadly foods, there are others but we suggest you do your research so you can learn as much as you can. Meals for Mutts, Kangaroo & Lamb..
Fresh meat, we alternatively use Kangaroo, rabbit, turkey, pork, veal and Big Dog barf patties. No beef or chicken, beef heats the blood and chickens, well you just don't know where they have been and we have not found it to be beneficial with bowels or skin issues. We also K9 Natural freeze dried lamb, very expensive but can help with those fussy eaters. Once a week we will give the dogs some sardines in oil or mackerel in oil (Omega 3). Please give them the oil, its good for their complexion (skin and fur). Cottage cheese is an excellent calcium source and the dogs love it and its gentle on the tummy, a teaspoon every other day. Eggs, cooked or raw once a week with the shell crushed up. Coconut oil or over the counter fish oil tablet (Omega 3) each day is excellent for condition but be cautious with the coconut oil, if you are too heavy handed it can give your dogs the runs. We have had amazing success with Canidae Pure Land, Bison & Lamb dry food and mix that up with some Big Dog Barf patties, turkey, lamb, kangaroo or rabbit...if you find this is not doing the job try lamb steaks or lean lamb mince. Again we are not saying we are right we are just saying what has worked for us. ​Dogs are by design carnivores, so to satisfy their need to chew and to keep their teeth clean there are a number of different things you can supply. Raw bones are the best form of teeth cleaner and your dog will love you for it. ...we recommend lamb necks... lamb necks are good because your dogs teeth slip in and out of all the nooks and crannies of the bone, if you get them from you local butcher get them to slice the neck in half so it is manageable for your dog..if there is excess fat, trim that off. Small lamb or beef bones are good too but see if your butcher will cut them length ways to expose the marrow. Please do not leave your dog unsupervised with a bone. ​You do have your commercial teeth cleaner chews such as Denta bone etc and they do serve a place just please remember to buy a decent one, don't do the dollar shop rubbish. You also have toothbrushes and toothpaste for dogs, if you can get your dog to sit still for this procedure then you are very lucky. Things you possibly shouldn't give your Frenchie is chicken necks due to fact that Frenchies tend to try and swallow them whole which presents a choking hazard...we know of many a dog who has died this way....if you wish to use chicken necks, chop them up, better to be safe than heart broken. ​Other things to avoid are pigs ears or any other rawhide product, the dog chews on them and after a while turns into glutenous mess which your dogs tries to swallow. French Bulldogs overheat quickly because of their extremely short noses and inability to effectively cool the air they breathe. Any dog especially a Frenchie must NEVER be left in a car unattended even on "cool" days. Walk or exercise your French bulldog only in the cool of the morning or late evening in the warm months, not in the heat or sun of the day. Never tie your Frenchie out in the sun, and provide shade and water if your Frenchie is outdoors with you while you are gardening or entertaining on sunny days. Watch for excessive panting or signs of distress, and act quickly to lower your dog's temperature if he gets too warm: a tepid shower bath, cool cloths, and a trip to the vet. Invest in a cool coat and/or a paddle pool to ensure you are ready for the warmer days. don't allow your Frenchie to pant too much. Panting too hard can cause his palate, tongue and throat to swell and close off. That's a deadly situation called brachycephalic airway syndrome (BAS). It doesn't have to be a hot day, your dog doesn't have to be overexercising or playing, though these are two ways your dog can start to pant too much. Just getting overexcited can set off a problem. Too much panting can literally kill your dog. If your dog is panting heavily for more than 5 minutes, remove him from where ever he is, take him somewhere cool and quiet and apply cool or tepid, not cold, cloths to his abdomen, or put him in the tub and run cool or tepid water on his abdomen. If this method doesn't result in less or no panting within a few minutes, take your dog to the vet immediately. Another area of concern is water, on the whole Frenchies cannot swim. ​Every summer we hear of dogs drowning in a swimming pool, pond or lake, and it is so very sad when it possibly could have been avoided. Take your eyes off your dog for just a few minutes, and, like a toddler, a dog can be in the pool and drown more quickly than you can imagine. Any time your Frenchie is near a pool, pond or lake, put the life jacket on. You could save yourself a lifetime of "if only's." ​There are many reported deaths of Frenchies and short snouted dogs on planes and our advice would be don't fly them but because of our vast country sometimes it cant be avoided. ​You must also take into consideration that the airlines take NO responsibility if you lose your beloved pet and yes sometimes the cargo hold is air-conditioned but that will not stop your pet from dying. Stress...most airlines require you to have your dog booked in 45 mins before the flight, then they are shuffled around for a while and then placed in the cargo hold, and then those engines start, can you imagine what that dog may be experiencing? a lot of dogs die before the plane even takes off, so if you feel your dog is the type to stress, we suggest you visit your Vet and discuss appropriate measures to ensure your dogs safe arrival at the other end. Time of day plays another big part in the safe arrival of your pet, make sure you book your dog onto the first flight in the morning or the last flight at night, especially in the warmer months and make absolutely sure your dog has plenty of water in his flight crate. 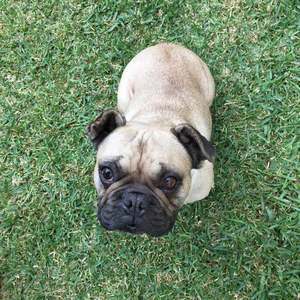 The term Brachycephalic Syndrome refers to the combination of elongated soft palate, stenotic nares, and everted laryngeal saccules, all of which are commonly seen in Frenchies. Elongated soft palate is a condition where the soft palate is too long so that the tip of it protrudes into the airway and interferes with movement of air into the lungs. Stenotic Nares are malformed nostrils that are narrow or collapse inward during inhalation, making it difficult for the dog to breathe through its nose. Everted Laryngeal Saccules is a condition in which tissue within the airway, just in front of the vocal cords, is pulled into the trachea (windpipe) and partially obstructs airflow. Some dogs with brachycephalic syndrome may also have a narrow trachea (windpipe), collapse of the larynx (the cartilages that open and close the upper airway), or paralysis of the laryngeal cartilages. Dogs with elongated soft palates generally have a history of noisy breathing, especially upon inspiration (breathing inward). Some dogs will retch or gag, especially while swallowing. Exercise intolerance, cyanosis (blue tongue and gums from lack of oxygen), and occasional collapse are common, especially following over-activity, excitement, or excessive heat or humidity. Obesity will aggravate the problems. Many dogs with elongated soft palates prefer to sleep on their backs. This is probably because this position allows the soft palate tissue to fall away from the larynx. The signs associated with stenotic nares and everted laryngeal saccules are similar. 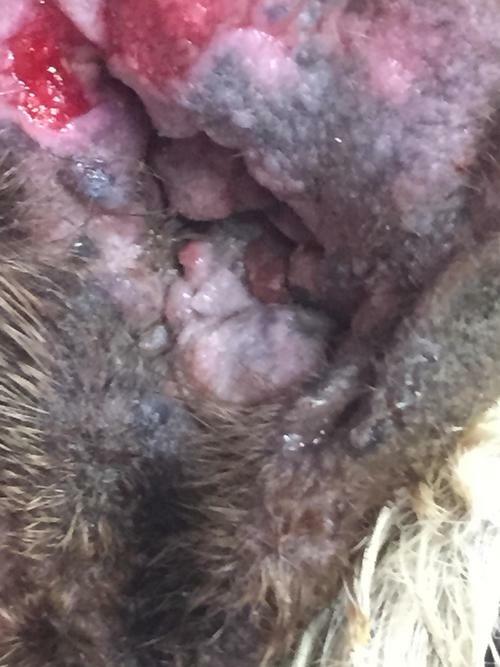 Brachycephalic syndrome should/must be treated if they cause distress to your pet, become more severe with time, or cause life-threatening obstruction. If your pet shows gagging, coughing, exercise intolerance, or difficulty breathing, treatment may be necessary.